Yatsenyuk said the payment of pensions and government benefits to residents in conflict-stricken parts of the east will resume after separatist forces have surrendered there. The government has not been paying pensions in those areas for several months, but has said back payments will be paid to recipients when the rebels move out. Ukraine's government has blamed Russia for fomenting the last six months of fighting between government forces and separatist fighters in the east. Moscow denies that it supplies rebel fighters with either manpower or military equipment. 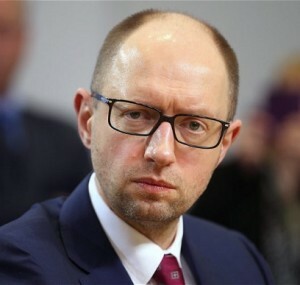 Yatsenyuk said suspending subsidies to the rebel-occupied areas would cut off a vital source of funding for rebel forces. "The money we pay into those territories today does not get to the people but is stolen by Russian bandits, and this would be nothing but directly supporting Russian terrorism," he said. The regions are among the most economically depressed in Ukraine and living standards have slipped further since hostilities erupted. Yatsenyuk said gas and electricity from government-held regions would continue to be supplied to rebel zones. "Those are our citizens and the government will not allow these people to freeze, as this would lead to a humanitarian catastrophe," he said. A cease-fire was agreed upon in early September but fighting has still continued. More than 4,000 people have been killed in the region since the conflict began in April, according to UN estimates. Deputy Defense Minister Petro Mekhed was quoted as saying today that military intelligence had noted a recent increase in the number of Russian troops in the Donetsk and Luhansk regions.